Annie-B Parson and Paul Lazar team together to bring Anton Chekhov’s 19th-century short stories "Man in a Case" and "About Love" to life in a format that is ground-breaking, original, and yet out of reach for those unfamiliar with Chekhov. Parson and Lazar fuse together theatre, dance, music and video to tell two stories of love, denial, and fear and how those three little things can bring joy as easily as they can abject sadness. Mikhail Baryshnikov, Jess Barbagallo, Tymberly Canale, Chris Giarmo and Aaron Mattocks combine to formidable stature. In a constant, brilliant format of storytelling, the audience is drawn into the tales of two hunters who tell the story of a teacher whose life of routine and safety and predictability takes a dramatic turn when he meets an audacious young woman whom he falls in love with. In the second movement, we meet a farm worker who tragically falls in love with a married woman. Their tale, doomed from the start, draws themes from the first piece, linking them in ways audience members will likely discuss at length for days afterward. Chekhov’s works are often misunderstood or produced in ways that refuse to acknowledge the writer’s intent. His theatre is a theatre of mood as much as it is about story. In big broad strokes of a brush, the beauty is in the world of the play as much as it is in the details. This is a production of the finest pedigree. 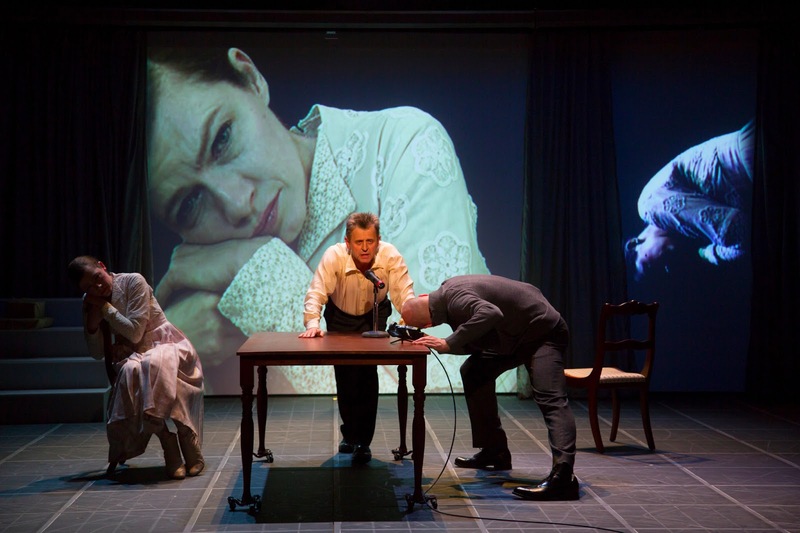 Larson and Lazar capitalize on Chekhov’s refusal to conform to a stage and introduce his work to the 21st century in a completely original format. This is not a night of theatre for the uninitiated. It is also not a night of theatre for patrons looking to see Baryshnikov dance either. There is certainly movement and a few moments of folk dance, but Baryshnikov is a storyteller here and he is masterful in doing so. Of course, watching Baryshnikov move across a stage with the grace and liquid movement of a cat certainly counts as dance. For those familiar with Chekhov, this is a victorious production of two challenging pieces of writing. For those willing to break out of a comfort zone, a little bit of reading will bridge the worlds of interpretive theatre and realism in ways that one can only begin to imagine.